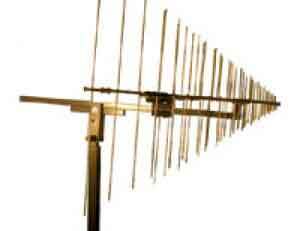 The stacked Logarithmic Periodic Dipole Antenna consists of two ordinary Log Periodic structures. The excellent characteristics (flat gain over a large bandwidth, low SWR) of the ordinary Log.-Per. designs could be maintained using the stacked LP design. The stacked design helps to focus the directional pattern of the H-plane somewhat, resulting in a typical gain improvement of ca. 2-3 dB compared to an ordinary LPDA. This is especially important for immunity testing, where a maximum fieldstrength and a good field uniformity is required. The beamwidth in the E-plane and the H-plane are nearly identical, providing an optimised illumination of the EuT with minimised ground reflection influence. Further the STLP 9128 C has an excellent cross-polar rejection. The stacked Log Periodic Dipole Antenna (Stacked LPDA) consists of two ordinary Log.-Per. structures. The excellent characteristics (flat gain over a large bandwidth, low SWR) of the ordinary LPDA designs could be maintained using the stacked LPDA design. The stacked design helps to focus the directional pattern of the H-plane somewhat, resulting in a typical gain improvement of 2.5 dB compared to an ordinary LP antenna. This is especially important for immunity testing, where a maximum fieldstrength and a good field uniformity is required. The beamwidth in the E-plane and the H-plane are nearly identical, providing an optimised illumination of the EuT with minimised ground reflection influence.Further the cross polar rejection of the STLP 9128 D is excellent. The fastlinks allows to disassemble the rear elements without any need for further tools within a few seconds. These fastlinks divide the antenna into five parts, which can be stored and transported easily. fastlinks for quick removal of the rear parts of the antenna. Recommended Adapter: AA 9209. Main Application: Generation of defined fieldstrength levels for immunity testing with good field uniformity and limited space. The stacked Log Periodic Dipole Antenna (Stacked LPDA) consists of two ordinary Log.-Per. structures. The excellent characteristics (flat gain over a large bandwidth, low SWR) of the ordinary LPDA designs could be maintained using the stacked LPDA design. The stacked design helps to focus the directional pattern of the H-plane somewhat, resulting in a typical gain improvement of 2.0 dB compared to an ordinary LP antenna. This is especially important for immunity testing, where a maximum fieldstrength and a good field uniformity is required. The beamwidth in the E-plane and the H-plane are nearly identical, providing an optimised illumination of the EuT with minimised ground reflection influence.Further the cross polar rejection of the STLP 9128 E is excellent. The fastlinks allows to disassemble the rear elements without any need for further tools within a few seconds. These fastlinks divide the antenna into five parts, which can be stored and transported easily. Main Application: Generation of defined high field strength levels for radiated immunity testing. The STLP 9128 E special is nearly identical like the STLP 9120 E but with folded longest elements and smaller structure angle. The stacked Log Periodic Dipole Antenna (Stacked LPDA) consists of two ordinary Log.-Per. structures. The excellent characteristics (flat gain over a large bandwidth, low SWR) of the ordinary LPDA designs could be maintained using the stacked LPDA design. The stacked design helps to focus the directional pattern of the H-plane somewhat, resulting in a typical gain improvement of 2.5 dB compared to an ordinary LP antenna. This is especially important for immunity testing, where a maximum fieldstrength and a good field uniformity is required. The beamwidth in the E-plane and the H-plane are nearly identical, providing an optimised illumination of the EuT with minimised ground reflection influence.Further the cross polar rejection of the STLP 9128 E special is excellent. The fastlinks allows to disassemble the rear elements without any need for further tools within a few seconds. These fastlinks divide the antenna into five parts, which can be stored and transported easily. Main Application: Generation of defined high field strength levels for radiated immunity testing. The STLP 9129 was especially designed for wideband immunity tests. 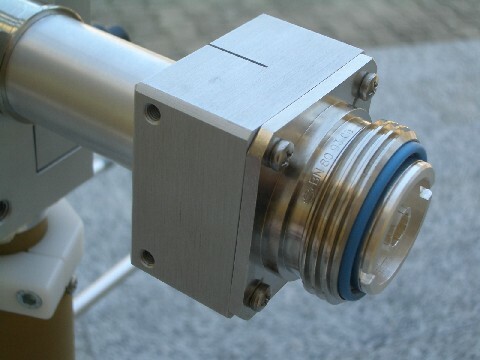 The unique STLP 9129 is able to cover the entire frequency range from 70 MHz to 10 GHz with a typical isotropic farfield gain of 8.6 dBi with a ripple of less than +/- 2.3 dB only. This unrivalled bandwidth was achieved by combining the both well proven antenna designs STLP 9128 D and the STLP 9149. The STLP 9129 does provide the optimum out of gain and field uniformity at the same time as well as both basic antennas do. Main Application: Generation of defined high field strength levels for radiated immunity testing acc. IEC 61000-4-3. Stacked Logarithmic-Periodic Broadband Antenna for Linear polarised RX- and TX- applications in the microwave frequency range. The antenna structure is made of laser-cut brass. For protection of the fine antenna structure against damage the antenna is equipped with a low loss plastic protection cover. The STLP 9149 is especially suitable for Immunity Testing acc. to IEC 61000-4-3 because of its good field uniformity. Further outstanding characteristics of the STLP 9149 are the wide bandwidth, the nearly constant high gain, very good impedance matching as well as equal beamwidth in E- and H-plane. 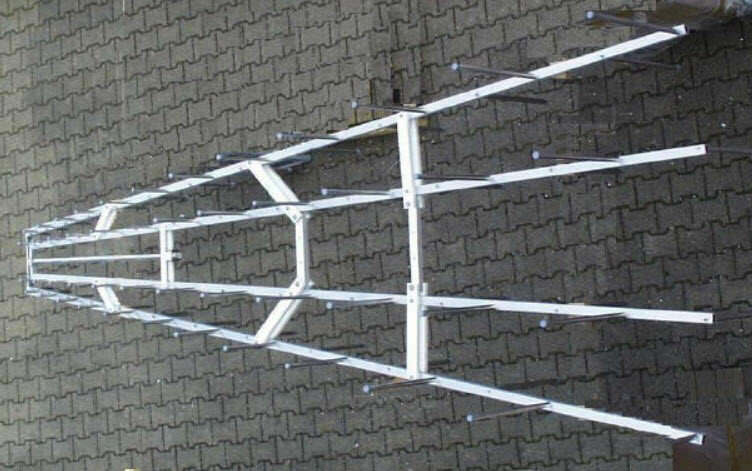 Linear polarized stacked Logarithmic Periodic Broadband Antenna with aluminium tubing for immunity testing with extremely high power.